Sunshine, a blue sky and rows of fluffy cumulus clouds sailing along just above the horizon: it feels like spring. And the annual food production has begun: in the week, I managed to get 167 cloves of garlic planted out on the allotment and, since yesterday, four different varieties of tomato - Sweet Million, Gardener's Delight, Beefmaster, Moneymaker - and sweet and chilli peppers have been germinating in seed trays under the Velux windows in the boys' warm loft room. 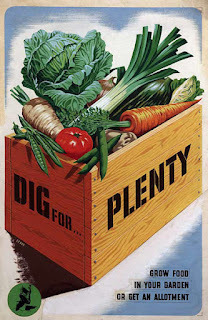 The past seven years of vegetable growing have taught me a couple of obvious things: it is worth growing as much as you can of crops that are expensive and it is worth growing as much as you can of crops that form a large part of your diet. As a family, we eat a lot of garlic but it is expensive to buy and we have had varied results growing it over the years. We have tried over-winter planting, we have tried spring planting; in both cases, the results have been the same: a moderately good crop but bulbs that are not that big. However, last year I planted spring garlic on the last day of January and had the best garlic harvest we have had. This year, the snow prevented similarly early planting but when the temperature rose earlier this week and the snow disappeared, I got out there with sixteen bulbs, broken into cloves, and had a planting frenzy. Last year’s garlic had run out by Christmas, I am hoping this year’s will last through until spring. I bought the bulbs on offer in a non-gardening shop and the person who served me asked how garlic grew. That each clove planted would turn into a whole bulb of garlic was a delightful revelation to her. At the same time as I sow tomato and pepper seeds, I usually devote a seed tray to aubergines; but after persevering with these temperamental plants every year, this year I have given up. I have invested a lot of time in trying to grow them but germination has always been hit and miss. I have tried a number of different varieties and some have fared better than others but any plants that have matured have taken up valuable greenhouse space only to produce poor fruit. The dismal truth is that, in seven years, we have been rewarded with only a few decent sized aubergines. So, no more; the greenhouse space will be given over to more cucumbers, which the kids devour in the summer months. And that’s another obvious thing that vegetable growing has taught me: don’t spend time and money on a crop if it outweighs the value of the harvest.